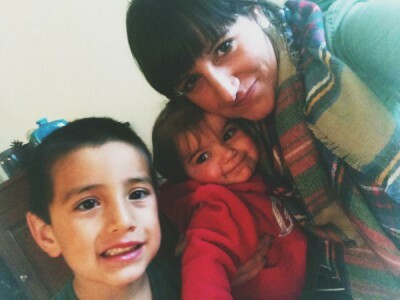 We’re so happy to chat with fashion instagrammer and working mama-of-two, Amanda Miller. Here, she spills her style secrets, talks precious mom moments, and shares what’s on her summer wish list. My go-to look usually involves destroyed denim, a mash-up of prints and patterns, and cute, colorful extras. Because I wear scrubs four days a week, I make sure that on the other three days I am actually getting dressed and looking cute. Putting on a fun outfit always makes me feel good about myself. Mornings are often hectic in our house (thank goodness for husbands!). My quick fix is either towel drying my hair and spritzing with a beach wave spray for a quick, natural look…or using dry shampoo for a day two hair. My makeup is basic: primer, foundation, some blush, mascara and eyeliner. It takes me all of five minutes to put on makeup—I’ve learned to do that quickly. A white midi-skirt, neon tanks, and flat sandals. I would love to score a pair of Tory Burch miller sandals in black. I wear my cognac ones all the time—they were an eBay find. I’ll never pay full price for a pair! I would tell myself not to sweat the small stuff and to go with MY instincts and what I feel works best for my baby and I. I did better with this the second time around but still struggled in the beginning. Society sets too many expectations for moms and really what it comes down to, is that you do the best you can for your family and yourself—that is a win, win in my book. It is truly hard for me to come up with my most precious memory because every single day I look at my kids and it’s precious. Their smiles and their laughter is my absolute favorite thing in the world. I love to watch them grow and see them learn. Not every day is perfect and there are many times I have doubted myself as a mother, but my children are happy and healthy and that’s all I can ask for, and something that I can be proud of!